First of all, you found the PERFECT man! Then, you found the PERFECT Dress. Then, you picked all perfect bridesmaids and church, reception site and decorations. But wait! Let's go back to that perfect dress. it's hard to look spectacular if you're miserable. Hemming of any style dress. No need to worry about sealed hems or "pickup" hems. We've dealt with them all. When we're done with your perfect dress, it will look like it was custom made. 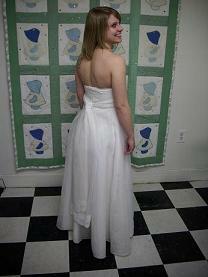 We do dozens of bridesmaid and prom dresses each season and haven't been bested by anyone yet. Lots of other places require appointments and reservations, but we don't. 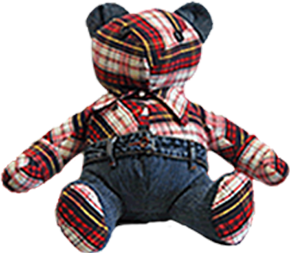 All the seamstresses at Pins and Needles Alterations have had lots of experience with formal wear, so your dress is safe in our hands. All you need, when you come in, are your shoes and whatever undergarments you will wear that might change the way the dress fits. 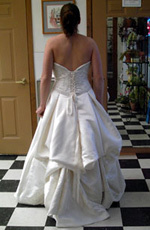 It’s best to come in 2-3 weeks before the wedding, to allow for second fittings, when necessary. We also cater to Mothers of the Bride and Groom, as well as flower girls. Men's tailoring, hemming of suit pants and coats when needed, is also available, so the men in your party can look their best, too. 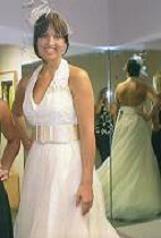 Let us outfit your entire bridal party to look its best. 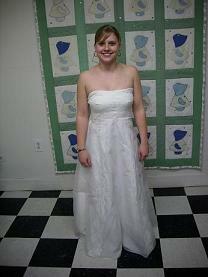 Lacee Heald always dreamed of being able to wear her Mom's wedding dress on her big day. However, Mom and Dad were married in the '70's and as you can see, styles have changed a lot. Lacee and her Mom are virtually the same size, so it wasn't necessary to change the size much, but the style needed lots of updates. Other alterationists told her it couldn't be done, but not here! We love a challenge, especially when there are emotional ties to consider. We totally changed the bodice style by removing the sleeves and neckline chiffon. Then we "un-gathered" the skirt for currently styled sleek look. 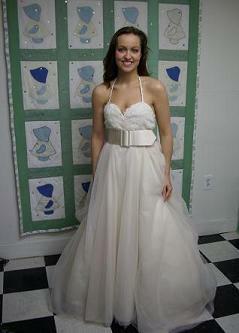 We dropped the waist just a touch and added a chiffon sash made from the original detachable train. 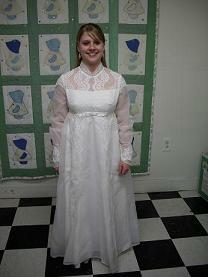 Lacee couldn't be happier with her new "vintage" gown. So we removed it and added detailing to the narrow support straps that were already there. So now Jessica has a "double designer" gown. 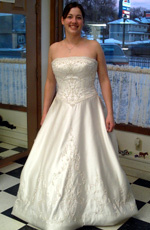 Jessica's review, " I LOVE MY DRESS!"